…of thinking that the tiny butterfly bush I dragged home from my local garden center couldn’t possibly grow to be 12 feet high as the tag described. I though that perhaps other people’s butterfly bushes might get that big, but mine surely wouldn’t. The hardpan Maryland clay, my relative inexperience or a host of potential perils would surely prevent 12 feet of unfettered growth. Five years have proven me quite wrong. I have spent three years staring at amazement as the bush that I religiously hack to about three feet of sticks in the fall burst back to life and grow to nearly 12 feet by June. The butterfly bush has been threatening to overtake the two Nikko Blue Hydrangeas planted on either side. In fact, the butterfly bush has grown so unwieldy that I planned on having Walter, my sometimes handyman, dig up the beast and move it to a more suitable location. Unfortunately, Walter was a little late in arriving this year and the bush was already in full leaf–not a good time for a major move. We’ll be living with the monster butterfly bush again this year. The beauty of it, though, is that with all the blooms, the bush attracts dozens of butterflies at any time. The don’t call it a butterfly bush without a good reason. I can look out my kitchen window and see butterflies any time of the day. It’s hard to beat that. And I’ll certainly miss that nature show when the butterfly bush is finally moved to roomier quarters. Ah, you must have thought you lived in the Midwest, where Butterfly Bush is a die back shrub that never gets that big. Neat for seeing butterflies. Really? This one dies back in the winter, but that doesn’t slow the summer growth. I know that they are also considered invasive in some places. Not in Maryland. I have never see any evidence of it spreading. Oh my goodness! I just planted one about two feet tall a few months ago. In the midst of other bushes! And it will get that big? I didn’t believe the tag! If the tag said 12 feet, believe it! Maybe I need to move mine too. I live in the Midwest, but I don’t want to take any chances that mine can get that large. It’s blooming now, but I’ve yet to see a butterfly on it. Hopefully soon. If you still have the tag it’s worth checking to see what the size projection is. I think that different varieties grow to different sizes. It is odd about the butterflies though. I really didn’t believe they would attract so many, but it does. We live in Florida…and I bought FOUR???? Ack. I’m really laughing here. i wonder if you have the 12 foot monster variety. Hey, MINE won’t get that big. I have NEBRASKA clay, much thicker and harder. Oh, yesssssirrrrreeeee. Well, maybe you have a different kind of butterfly bush too. I wish I had kept the tag so I could tell everyone exactly what kind this is. I put one in a four by four foot spot between two rose bushes. Total disaster. Hoh, I can see how that can happen. You didn’t say what you did. Tear it out? Robin – replace it with the new Peacock (or Peakeep) series (only get 4′-5′ they say). Butterflies still love it. I planted one spring 07 – it’s lovely, branching and well behaved here in hot Nor Calif.
I’ll look into the Peacock series. There are many other places I could put butterfly bushes. And I do love them because they are like butterfly magnets. Seriously — TWELVE FEET? I have three of them. Not in places for 12 ft trees! Mine are a year or two old. Hmmmmm. 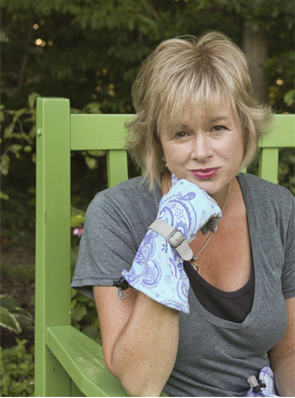 I love them though – I have one lavender and two stunningly beautiful magenta-ish colors that take your breath away. I love that one between your hydrangeas – which, by the way, are also beautiful. I’m thinking that not ALL butterfly bushes will get to be 12 feet. Mine is though. If they really do grow to 12 feet I’m in trouble. Looking at the close up shot of the flowers mine look to be a different variety … let’s hope so. The hydrangea are absolutely stunning… I’m very jealous of those blue beauties. 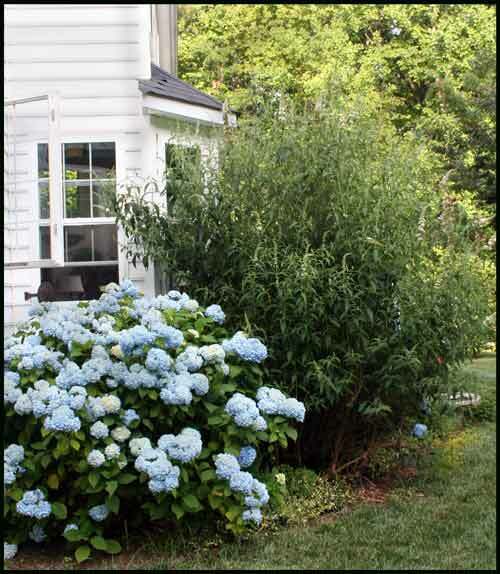 The hydrangeas were planted the same time as the butterfly bush. They are Nikko Blue. i have so many flowers that we cut and bring them indoors. That is one big Butterfly Bush! It does a great job of blocking your view, too! Where will it be relocated? Meems is right, those are good looking Nikko Blue Hydrangeas! Sigh. I can only DREAM about buddleia doing this–I buy them as little plants in 4 inch pots usually each year, and they grow fairly well and flower…then die over winter. In some parts of North America, they’re selfseeding and becoming a nuisance but that will never be on this end of the continent! I love the yellow one the best, and it seems to be extra-spleeny and slow to flower here. But I keep hoping…. OH MY GOD!!! This will never happen to me–as others have commented, you live in a possible zone for this. But I am always encouraged by the way my two butterfly bushes resurrect themselves every summer. 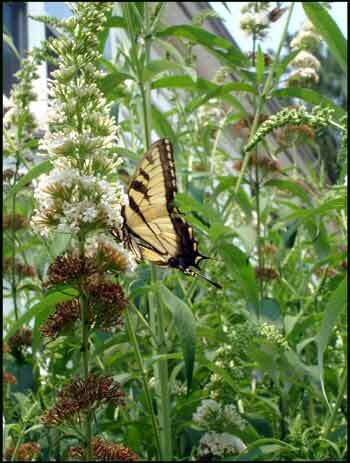 That butterfly bush (with accompanying tiger swallowtail) is something this Zone 4 gardener can only dream about! I have the same Hydrangea as you have beside your butterfly bush. It is probably 30 years old, and not in great shape; they’re in full sun, (I live on the south west coast of Canada), and every year the flowers bloom that beautiful cerulean blue and promptly turn brown. How do you care for yours? My white butterfly bush is about 20 feet high and 20 feet round and I love it! Its always full of bees and butterflys and hummingbirds. Robins build their nests in it every spring. I NEVER prune mine back ever. Its right off my porch and I sit and drink my tea and watch the show from my porch. The trunks or branches are 5 inches in diameter. It hangs close to the ground and my daughter wants to build a fort under its branches. I would let her except for the ticks. I live in Harrisburg, PA where we sometimes get some pretty bad ice storms and I thought for sure a couple of times I would lose my beloved bush but it bounces back every singlr time. I have a butterfly bush, its turning brown and the leaves are starting to fall off. The bush is in its second summer and did well over the winter and spring. I planted it in my butterfly garden and with the record high temps (Maryland) I water it everyday. What should I do? Pull it out and get a new one or just ride it out and see what happens next spring? What else should I do? HELP!